Lunch at Church's Chicken, at the corner of Huntington and Shamrock. Got the three-piece lunch for $7.49. Came with drink, biscuit, mashed potatoes and handy spork. Not health food, but filling and tasty. If you want something healthy, go next-door to Something Healthy. 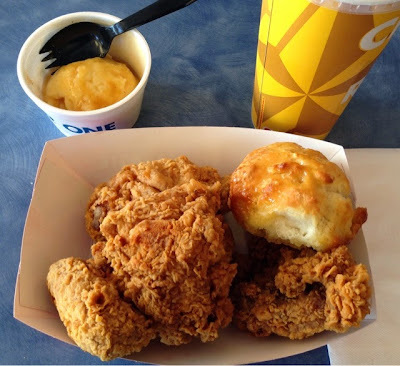 There was a sign saying, "Have a side of chicken genius." No clue what that means and neither did the attendant. They were filming something at that location 2 days ago & had signs up for the shoot possibly left over? The clear winner for the most unhealthy lunch that you've ever taken a picture of. My heart hurts just looking at that potato thing in the cup. "Have a side of chicken, Genius."